“Trump Says Russia Inquiry Makes U.S. ‘Look Very Bad'” [New York Times]. NTDT, but I keep hearing faint faraway sounds of hysteria on this interview, but suppose we crossed out “Trump” and wrote in “Bush.” For example: “It makes the country look very bad, and it puts the country in a very bad position,” Mr. Trump Bush said of the investigation. ‘So the sooner it’s worked out, the better it is for the country. '” Now I know Bush sets a pretty low baseline, but given that the liberal Democrats have now rehabilitated Bush, to appeal to suburban Repubicans, is the interview really that bad? In fact, now that I think about it, it’s probably better than Reagan, certainly after Reagan started losing his mind, and the liberal Democrats rehabilitated Reagan, too, for the same reason they rehabilitated Bush. “Movement Pedagogy: Beyond the Class/Identity Impasse” [Viewpoint]. “In this essay, we suggest that when we think pedagogically about organizing, we arrive at a coalition between concepts that can appear to be incommensurate. Thinking pedagogically renders a coalition between the universality associated with class struggle, and the positionality that is key to a radical identity politics. Thus, we contend that the field of education offers crucial lessons for today’s activists.” This is a very interesting article, well worth a read. And the Morris Louis painting at the top is a bonus. Oh, and appealing to adjuncts…..
No states today; the markets close early. Debt: “Goodbye, George Bailey: Decline of Rural Lending Crimps Small-Town Business” [MSN]. “The financial fabric of rural America is fraying. Even as lending revives around cities, it is drying up in small communities. In-person banking, crucial to many small businesses, is disappearing as banks consolidate and close rural branches. Bigger banks have been swallowing community banks and gravitating toward the business of making larger loans.” Rural internet is going to be strangled too, if Pai’s abolition of net neutrality goes through. And then there are opioids. It’s almost like the powers that be are writing off flyover country entirely. “AN INTRODUCTION TO COUNTERFEIT ICS: COUNTERFEITING, DETECTION AND AVOIDANCE METHODS” [ATADIAT]. “Another study conducted by the U.S Department of Commerce from 2005 to 2008 showed that 50% of component manufacturers and 55% of distributors have encountered counterfeit parts. Moreover, Experts have estimated that as many as 15 percent of all spare and replacement semiconductors purchased by the Pentagon are counterfeit products.” Not seeing links to that study, though. Readers? The Bezzle: “Tesla Inc is likely to deliver about 5,000 Model 3s in the fourth quarter, KeyBanc Capital Markets analysts said on Wednesday, far below the brokerage’s estimate of 15,000” [Reuters]. 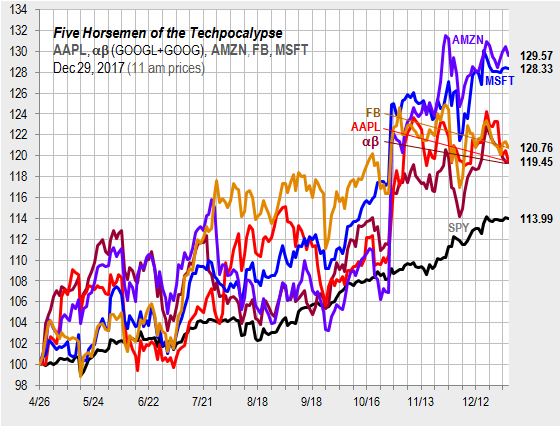 Five Horseman: “The Fab Five drift listlessly into the new year, all having beaten the S&P 500 index in 2017” [Hat tip, Jim Haygood]. Today’s Fear & Greed Index: 58 Greed (previous close: 62, Greed) [CNN]. One week ago: 66 (Greed). (0 is Extreme Fear; 100 is Extreme Greed. Last updated Dec 29 at 11:25am. This was a hard year to be in journalism. With shrinking newsrooms, an insane news cycle, and ever-tightening deadlines, it was easy to question whether your stories were worthwhile or if they made a difference to anyone. Self-serving, but still a good list. A strong local “paper” is important! Erica wrote 3/4 of a book on her own. She had a publisher already on lined up. She wrote dozens of articles that we never put out because of one thing or another. Her story IS incredible. Including what it took to just survive BEFORE the activism started. “Chicago incentivizes abusive policing through overtime policy” [The Chicago Reporter]. “During the two-and-a-half-year time period examined by the Inspector General, CPD paid out $225.5 million in overtime that cannot be accounted for because of coding errors. This may sound like a minor data tracking issue. But it’s significant because officers can only accumulate overtime pay for specific situations, like attending court hearings, working special events or an ‘extension of tour. CPD’s inability to track the reasons for overtime payouts undoubtedly helps facilitate a practice known as trolling–the most troubling abuse documented in the report. Officers engage in trolling when they actively seek ‘traffic, disorderly conduct or other violations at the end of a shift’ or when they ‘make an arrest at the end of a shift as a result of escalating a situation which would have been in the officer’s discretion to dismiss. ; Why do officers troll? Because if an officer makes an arrest after her shift was scheduled to end, she’ll get a bigger paycheck…” They get time-and-a-half. “California Marijuana Start-Ups, Shut Out From Banks, Turn to Private Backing” [New York Times]. “[Cannabis-focused accelerators and investment companies] have long been a presence in Silicon Valley, offering mentoring and investment in exchange for an ownership stake. Companies that provide these types of resources are critical to expanding a nascent industry around legal marijuana, said Mr. Krane, if only because they can introduce its entrepreneurs to angel investors and other private capital sources.” Hmm. Sounds a bit like sharecropping. “Storage Space for the Undead: Inside the Cryonics Business” [Literary Hub]. Odd assumption that today’s financial relationships will persist far into the future. “The Worst Job in Technology: Staring at Human Depravity to Keep It Off Facebook” [Wall Street Journal]. I can’t help but think that the “Angel’s Share” in this process is actual understanding of human depravity; this is, after all, an enormous anthropological effort. But no. All we get out of all the labor and suffering of the moderators is Facebook pages. “The Last Jedi and narrative risks *major spoilers*” [Observational Epidemilogy]. “[T]he trick seems to be to reverse expectations at every turn and try to make it fresh and original as a result. But what struck me is how they somehow managed to avoid all of the real narrative risks that they could have taken with the story.” Sounds like Game of Thrones without the thrones. Or, I suppose, the game. “Why Studio Ghibli should make a film of Philip Pullman’s Northern Lights” [New Statesman]. “[T]here are some particularly interesting parallels between Miyazaki, who co-founded Studio Ghibli, and Pullman. Both were born in the 1940s, with fathers involved in military aircraft – Miyazaki’s manufactured parts for Japanese fighter planes, while Pullman’s father was an RAF pilot. Both have an interest in flight that runs through their creations…. Both share an anxiety about manmade environmental disaster… Both show a recurring interest in coming-of-age stories and a secular optimism that a younger generation can remake the world for the better.” There’s a new Philip Pullman book out, featuring Lyra (“lyar”). Wish I had time to read it, but maybe a reader received it for Christmas? I’m specifically writing to ask you to come to Minnesota for a meetup. I feel hopelessly alone in my state, in spite of how liberal we are supposed to be…. The last straw for me was this Christmas, when I tried to explain fiat currency to my dad, the die-hard Republican. I tried to explain how the Trump tax cut is a scam to cut his Social Security and Medicare. I know how insufferable socialists are when they start explaining things, but I couldn’t help myself. He was receptive, but even I understand that knowledge doesn’t equal power in our society. If you aren’t able to come to Minnesota, is there someone you could connect me with here? I really need someone to exchange ideas with. Thank you, and happy new year! To which I respond: I think that’s a noble effort on fiat currency. I don’t do meetups except during the summer. And I’m not sure Yves will be able to. But nothing prevents Minnesota readers from setting up a meetup for themselves, which we will be very happy to publicize. Also, I’ll be happy to act as any intermediary for any other Minnesota readers who want me to forward their email address on to the writer. Finally, this is a dark time of the year, especially in Northerly regions, especially with the horror of daylight savings time, so be sure to take a walk in the sun, and remember that the shortest day of the year is behind us! Readers? 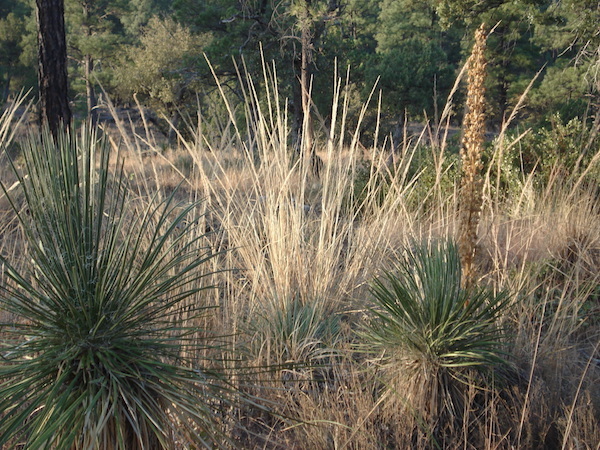 Haygood writes: “Wild grasses in Tonto National Forest Arizona this morning.” December 14. Not a lot of snow in Arizona, yet, I take it.. Readers: Water Cooler is a standalone entity not covered by the NC fundraiser. So do feel free to use the dropdown and click the hat to make a contribution today or any day. Here is why: Regular positive feedback both makes me feel good and lets me know I’m on the right track with coverage. When I get no donations for five or ten days I get worried. More tangibly, a constant trickle of small donations helps me with expenses, and I factor that trickle in when setting fundraising goals. So if you see something you especially appreciate, do feel free to click the hat! This entry was posted in Water Cooler on December 29, 2017 by Lambert Strether.